Armed with litigation experience and an intimate knowledge of the criminal system, Brett opened his private practice in July of 2012. Since that time, Brett has expanded his areas of practice to include personal injury and family law, in addition to DUI defense and criminal defense. Brett credits the success of his practice to his extensive litigation experience and his focus on excellent client service – evidenced by more than 70 5-star client reviews. 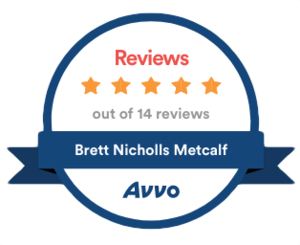 Brett has received numerous recognitions and awards, including The National Trial Lawyers “Top 100 Trial Lawyers” and “Top 40 Under 40”, a perfect 10.0 rating on Avvo.com, and he was named 2018 SuperLawyers Rising Star. Also in 2018, when Tampa Magazine conducted a survey of 11,000 lawyers in Tampa Bay, Brett was voted by his peers as the #1 DUI Defense lawyer in Tampa. Brett remains active in the legal community through his service with Hillsborough County Bar Association’s Young Lawyer’s Division. Brett was elected by his peers to a 2-year term as a Director to the Board in 2016, and was recently re-elected to another 2-year term in 2018. When he’s not lawyering, Brett has a passion for grilling/smoking meat on the weekend and spending time with family. He also dabbles in fantasy football in his free time – not the illegal kind, though.